We’re not quite sure in which category this fits, but we found this an interesting media product that we haven’t seen before. The commemorative NFL Champions book presented June 16 to the players, coaching staff and management of the Super Bowl championship-winning New Orleans Saints during their Ring Ceremony is no ordinary book. To celebrate the story of the Saints Super Bowl victory in a way that truly captures the exhilaration of a triumph that both celebrated and defined the rebuilding and resurrection of New Orleans, each member was presented with a book that is a breakthrough in integrated paper and video technology created by Americhip, Los Angeles. The book allows readers to flip through cover-to-cover as normal – as well as through a paper-thin video screen, allowing viewers to re-live the highlights of the unforgettable 2009 run to glory. 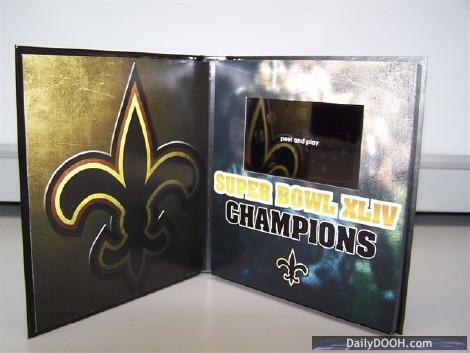 There are more surprises revealed in the book: Loomis and Sean Payton, the Saint’ head coach, had a customized segment created at the end of the highlight video that brilliantly represents the Saints fighting spirit. Loomis says that the book is a celebration of that victory, and should make people happy every time they look at it, briningg them right back to that defining season. Los Angeles based Americhip is a pioneer of Video in Print and specialist in developing multisensory marketing technologies that make it possible for people not only to read – but to hear, watch, view and engage with the action. Americhip operates in 15 countries worldwide. This entry was posted on Wednesday, June 23rd, 2010 at 08:15 @385 and is filed under DailyDOOH Update. You can follow any responses to this entry through the RSS 2.0 feed. You can leave a response, or trackback from your own site. Who would ever want such a pile of rubbish, unforgettable run to glory! The very mention of the name brings a vile smell to mind. – Who dat, who dat, them dirty saints!! !